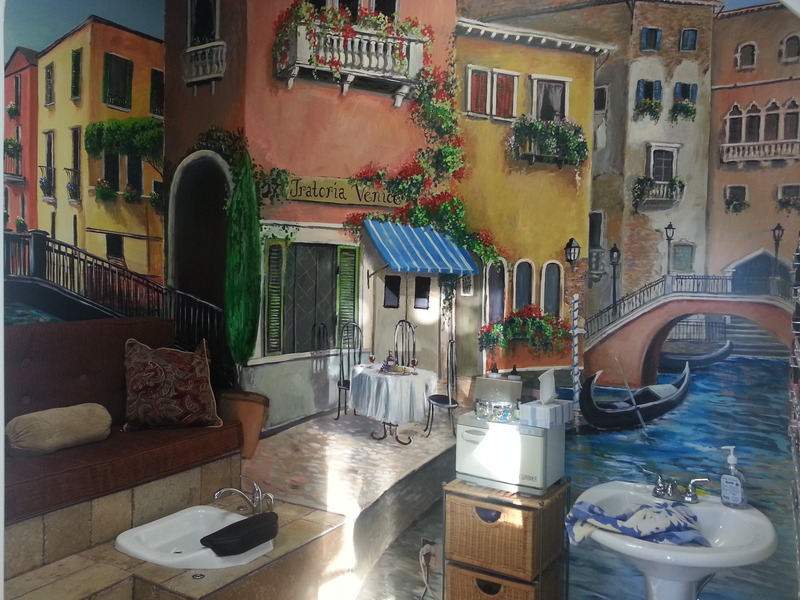 I just finished a large mural for a salon and spa in Mesa. 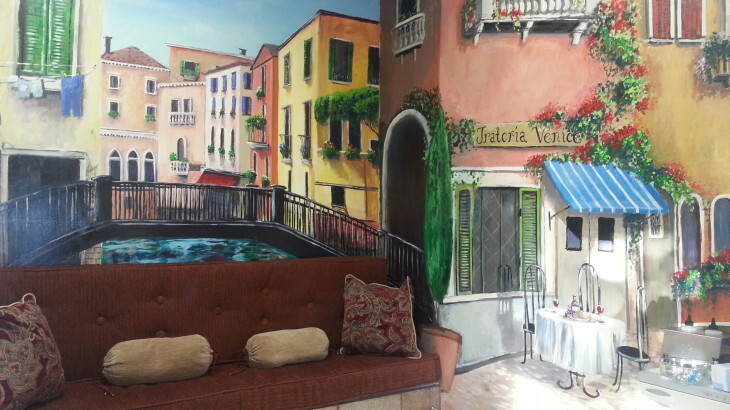 Tina, the owner, already had this pedicure room set up and when I saw the bench seating with the rich colors I immediately reminded me of a gondola in Venice. The theme of the salon is an old world European village so I knew this would compliment her already existing décor and theme. So now as clients sit and enjoy a wonderful pedi they get to experience a feeling of floating down a canal in Venice. It always amazes me how just paint on a wall can evoke a feeling and transport you to a far away land. I have done murals in the past which included snow and I actually felt cold when I was done. I love my job and cannot imagine doing anything else!! I hope my body can keep going for many years to come. There is something so satisfying when you get to see the end result and how it brings joy to people! I am thankful to God for this gift! If you would like to enjoy my work I have done for The Village Salon and Spa and at the same time receive amazing services from Tina and her staff, you can set up an appointment by calling 480-380-2787. They are located on baseline and signal butte right next to the movie theatre. They are a full service salon and spa and do everything from hair and nails to eye lash extensions and tanning. My next few projects will take me up to the west valley and I will be transforming some backyards. I will blog and post pics when I am finished with those. Have a wonderful day and God bless!! Blog Mural, salon, spa, Venetian. permalink.